UK companies are being forced to pay more to borrow on bond markets than their European peers as investors demand a hefty premium to compensate for a future hit to business and the UK economy from Brexit. Companies as varied as telecoms giants BT and Vodafone, security firm G4S and the Royal Mail are facing what can be described as a "Brexit premium", bankers and bond investors said. With less than four months to go before the UK leaves the EU, there is still a risk of it crashing out without a trade deal. Prime Minister Theresa May is widely expected to lose a crunch parliamentary vote next Tuesday on her withdrawal agreement. Still, some kind of agreement is considered the most likely outcome, and the odds are also shortening on Britain eventually staying in the EU. But the gap between British companies' bond yields - the cost to borrow from investors - and that of European rivals has surged to the widest in years. He said yields on British banks' bonds have widened by around 70 basis points on average since early-October compared with 25 basis points for their European counterparts. Vodafone last month had to offer generous 30-40 basis-point yield premia over existing debt to lure investors to its €2.5 billion new issue. Similarly, BT recorded lacklustre demand when it sold £750m in long-dated bonds, International Financing Review reported. The moves show that investors across asset classes are increasingly worried about the consequences of a loosening in ties between London and its biggest trading partner - until now it was largely sterling that bore the brunt. 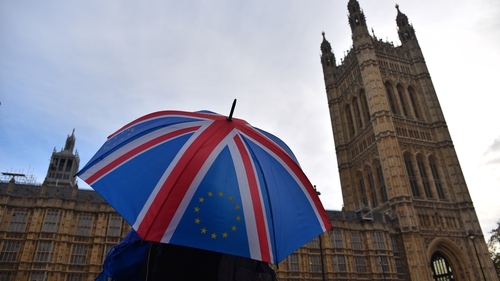 Exiting without a deal in March will leave Britain's economy 5.5% smaller by 2030 than under EU membership, a recent study by think-tank NIESR showed. The Bank of England is more pessimistic, predicting that in a worst-case scenario Brexit could inflict a bigger hit to the economy than the 2008-2009 financial crisis. The jitters are most evident in the cyclical and banking sectors, that are closely tied to growth. And it is in the secondary market, where already-issued bonds are bought and sold, that the Brexit premium is particularly striking. The bonds of British banks Barclays and HSBC trade at a substantial yield premium over many European lenders, including the troubled Deutsche Bank. But what if Britain manages to agree a last-minute exit deal? If May's Brexit deal is approved, it will still leave Britain's economy 3.9% smaller by 2030 than if it were to Remain, the NIESR study calculated. Markets may also be positioning for a hit to corporate credit ratings, with Moody's recently highlighting risks of higher trade costs and disruptions to logistics and supply chains. Firms in the automotive, aerospace, airline and chemical industries would be the most severely damaged, it added.